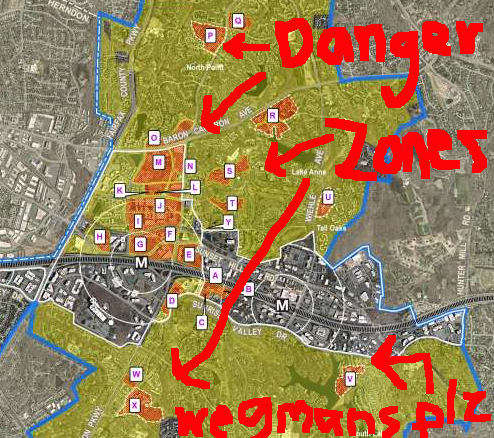 All told, the county says that 8,189 residential units have been planned or approved in the Orange Bollard Zones in that fancy map, with another 14,103 units biding their time in the planning pipeline awaiting the construction of sufficient infrastructure to accommodate all those new Restonians and their Ford Foci. Oops, that was a typo, silly rabbits, because in county planners' minds, none of those new residents will need cars, because they'll just hop on the Metro at Wiehle and go one stop to Reston Town Center to enjoy their midscale chain eatery fare and stick it to the paid parking regime at our favorite "stressful, city-like shopping center," leaving the rest of us non transit-oriented flatlanders with beautiful, congestion-free streets to get our woonerf on. Makes sense, except for one little thing: When you look at that fancy map, most of the Orange Bollard Danger Zones are well out of the concentric rings around the Metro stations that suggest how far people might be willing to walk. 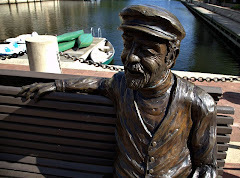 Some are part of the revisioning of big box nirvana and Macaroni Grill graveyard Reston Spectrum into mixed-use awesomeness that will extend Reston Town Center northward, and Lake Anne... well, we know how well that worked out the last time around. The rest, for the most part, are concentrated in and around the village centers -- developments like the CGI granny-infested plans at Tall Oaks, now approved and awaiting construction to begin in earnest, as well as all our other favorite strip mall locales. That's not exactly new. Redeveloped, more dense and mixed-usey village centers have been part of the plan for ages. And beyond the green zones that RA controls, there's been talk about building apartments above Plaza America for years to draw the lucrative fans of mass transit and glitter guns from Michaels. And it definitely makes sense to concentrate development around the village centers -- if done right, it could make them more vibrant, less generic and strip-mally, maybe. We could even get a Wegmans! But it flies in the face of the idea that we can wait on infrastructure improvements. 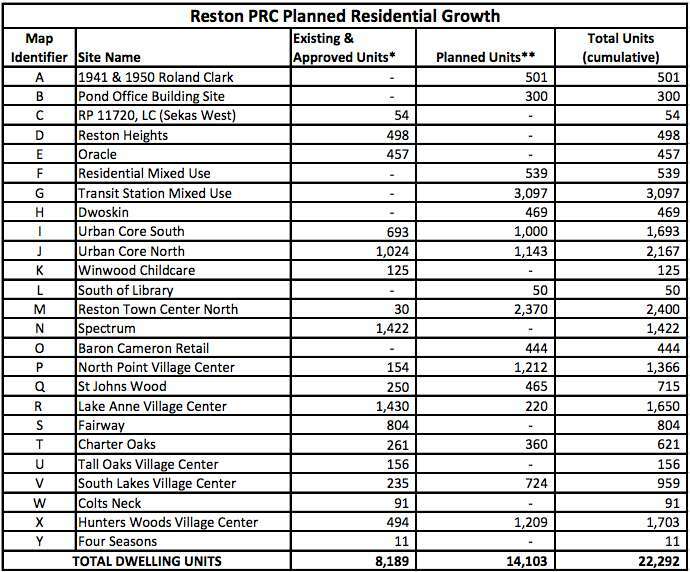 So as the county continues making its plans, the Reston Citizens Association, Reston 2020 and Reclaim Reston are holding an informational meeting tomorrow to explain the proposal in better, less alarmist detail than, say, a filthy "web log" might. It's at 7pm at the Reston Association headquarters and you might want to check it out, as the kids could conceivably have said back in the '70s. Next Monday, the 25th, the county will hold its own public meeting at 7pm at Lake Anne Elementary. It's hard to say what the listening vs. developmentsplaning ratio will wind up being, but efforts to push back on development already have had some impact. The original plans for the zoning change were to have the county board of supervisors vote on this next month. Now it's looking like February. Maybe there's still time to speed up the timetable for infrastructure development now that the Very Special Tax District is in place and bringing in some ducats for the county. Crazier things have happened. Buckle up, folks. It's going to be a bumpy ride -- at least when traffic is actually moving, the end. Update: Coverage of the Sept. 20 community meeting. "Developmentsplaining" is my new favorite word in the English language. "Zonesplaining" works, too. It's "Groundhog Day" -- again.